Well, we’re at the business end of the tournament, and yet no one is any the wiser as to who will come out on top. Victories for the Welsh and English respectively in round three mean no Grand Slam for anyone this year, and with four teams locked on four points it is all to play for in the final two rounds. ‘Friday night under the lights’ has not always been that popular a feature for the traditionalists, but the Welsh certainly didn’t mind. A pulsating atmosphere – created by a spectacular lights show pre-match – greeted Wales and France as they opened round three and all was set for a close-fought match. Except nobody told the Welsh players that! Hurting from their mauling against the Irish in the previous round, the Welsh steam-rolled into an 11-0 lead in the opening ten minutes thanks to two penalties and an opportunist score by makeshift centre George North. To say this was slightly one-sided would be an understatement as the Welsh pack pulverised the French pack just as the Irish had done to them in the previous match. 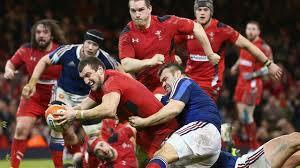 A super-human effort from the Welsh forwards who tackled anything in blue stifled a labouring French team who looked a shadow of the team that had won their opening two matches with Dan Lydiate and Sam Warburton in particular working together effectively. A superb try from captain Sam Warburton, stretching to get over the line, summed up a superb performance from the captain and his team in general as they ran out deserved winners by 27 points to 6. Renewed optimism for the Welsh as they picked themselves up from the disappointment of Dublin and put themselves right back in the frame, while France will need to take a leaf out of the opposition’s book in how to recover from a significant setback if they are to be crowned champions. The game of the weekend by far with four tries and a lot of free-flowing rugby, as Scotland dug deep to clinch a dramatic victory in Rome with Duncan Weir the hero with his last minute drop-goal rescuing a victory from the jaws of defeat. A fantastic game of rugby with the score line changing hands on numerous occasions right up until the final whistle. Coach Scott Johnson would have been happy to see his side cross over the whitewash for the first time in the tournament with two superb tries from centre Alex Dunbar as the Scots finally got their campaign up-and-running after two poor opening performances. For the Italians however an agonising result for Sergio Parisse’s team, as after two promising displays they failed to see out the win in arguably their biggest game of the tournament. The Scots will now go into their home match with France with fresh hope backed up by both their performance and the French in Cardiff. While the Italians face a now arduous task just to claim a victory in this championship with matches against title-contenders Ireland and England to come. Finally to the main course as Ireland went in search of the Triple Crown at Twickenham. Paul O’ Connell’s team arrived in London in good spirit as they looked to clinch a piece of silverware for Brian O’ Driscoll on his final appearance at rugby HQ. For the English, only victory would do to keep their title hopes alive after a mixed start. Luckily for those English, victory was what they got as Chris Robshaw’s men came out on top in a real arm-wrestle of a contest. As expected few tries were on display as both set of forwards slugged it out, and at first it seemed the Irish had the upper hand as replacement tight-head David Wilson was given a torrid time in the scrum by Ireland’s Cian Healy. 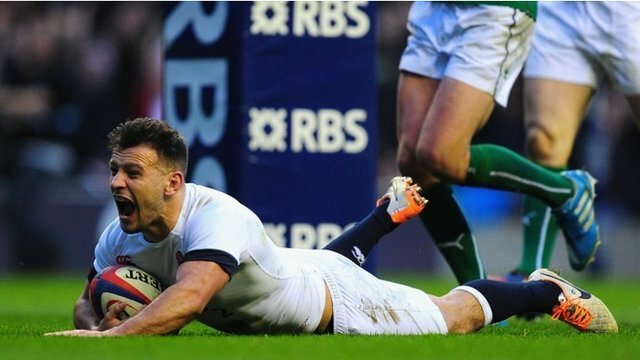 A score from Rob Kearney underneath the posts early in the second half reinforced their dominance, but inspired by man-of-the-match Mike Brown, England pulled themselves up. With the game finely poised midway through the second half, a break from the Harlequins full-back opened up the Irish defence before an offload to fellow Harlequin Danny Care allowed the scrum-half to run in under the posts to score the winning try. As the game wore on Ireland desperately tried to break through this white wall in front of them, but eventually succumbed to a narrow 13-10 defeat. So no Triple Crown or Grand Slam for the Irish who although disappointed by the outcome will still be confident they can win the tournament, while the English pulled themselves right back into the race and consequently make it a four-way battle for the championship. Roll on round four!